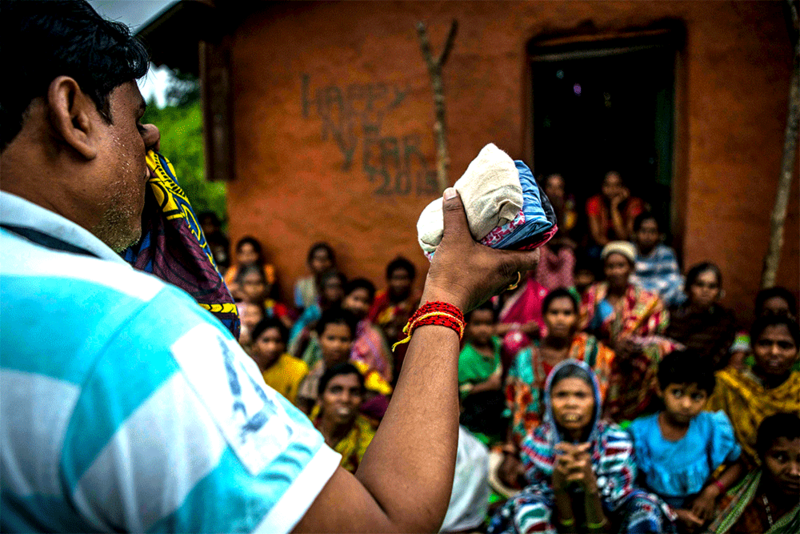 For generations, mothers and grandmothers across the world have used cloth as a sanitary pad. It’s only in the last few decades that the big brands have taken over, in the name of convenience of ‘use and throw’. Yet, even today if you ask most women in a village, ‘How many saris do you have?’ many will tell you, ‘not more than 2-3’. Is it difficult then to imagine how these women manage their menses every month, for years? This is the story of cloth; why it’s important for menstruation and how women suffer even for this basic..
About a decade ago Goonj was among the first to bring this ‘taboo’ subject and the related dire need of cloth into the limelight. With our guiding principles of dignity and matching material to the needs of the people, at that time we faced a few critical questions: Would reaching the market sanitary pads solve all aspects of the problem for women in the villages and slums? Could Goonj or any other entity in the world provide a woman in a far-flung village, disposable sanitary pad for her entire menstrual life cycle, spread over decades? Would sanitary pads, with non biodegradable content in the napkin or the outer cover, be good for the larger village ecosystem? Is there adequate infrastructure pan India to ensure proper disposal of disposable sanitary pads? What role could Goonj play in this massive, complex issue? These questions touch upon some ethical, practical and non product aspects of the issue. They connect not just with a woman’s social, physical and psychological health but also the larger well being of village communities. Clarity on these was critical to understand our own strengths, capacities and role in this issue. The fact is that sanitary pads that are practical, affordable and environment friendly are still on an experimental level across India. While the majority of Indian sanitary pads market is still held by the disposable commercial sanitary pads, village India still survives largely on old cloth or on unimaginable things like cow dung, sand, ash, newspapers/paper, jute gunny bag, dry grass, plastic or anything or nothing at all. We started a dialogue as the first step to address this issue, apart from providing a better piece of cloth for women, who didn’t have this basic. In the midst of a market full of fancy ‘ultra thin’ to ‘extra large wings’ sanitary pads, a humble piece of discarded cloth thus became a powerful tool for opening up conversations on menstrual health and hygiene with women all across. That’s why ‘Not Just a Piece of Cloth’ (NJPC), the name of our menstrual hygiene initiative. “Two-three days before I get my periods, I feel mentally ill, thinking of what I could use during those days, because there is no easily available cotton cloth. Whenever I think about the ordeal, I get a headache. When my periods start I take any thing from my house. I have spoilt cushions, pillow covers and even bed sheets during my periods. Due to that, I have been scolded and even beaten up many times by my mother but what can I do? Once in anger and frustration I didn’t have food for two days. When I asked my classmate for pads, she said, these are not for free. These are very costly. She had got them from the market. I feel sick and often pray to God to stop my periods forever.” Shalu (name changed) daughter of a tangewala (horse cart driver) lived in Saharanpur, Uttar Pradesh. Her father’s income was barely enough to meet the daily needs of his family. In a village in Firozabad, Uttar Pradesh, a woman died of tetanus as she used a piece of cloth that had a rusted hook. “It is a matter of shame and indignity. Who will speak about it? The entire village knows that she died of tetanus because of the hook,” said a villager. The unbearable trauma, desperation and compulsion you sense in the words of Shalu and Farzana; points to tragedies that unfold month after month for millions of women. We feel that this indignity and its effect on the sense of self and self confidence of women, is the most appalling yet the most neglected part of this debate today. The many issues; from the product to the disposal, the risks and difficulties to the shame and embarrassment, all add up to turn menstruation into a monthly disaster for women, every month. This 4 part story charts out Goonj’s insights, innovations and journey around menstruation as a woman’s most basic need and why the much maligned piece of cloth is a viable option. It makes you ask—if these women had enough cloth, some menstrual hygiene awareness and the space to freely speak about their menstrual challenges; would menstruation still be such a monthly disaster for them? These questions touch upon some ethical, practical and fundamental aspects of tackling the issue. Clarity on these was critical before stepping into something, which connected deeply with a woman’s social, physical and psychological health. Goonj had to find its own strengths, capacities and role on an issue which has three distinct dimensions-the triple A’s of menstruation: Awareness, Access & Affordability. Very early on we realized that even if a simple piece of cloth was made available to the masses, many incidents and stories that women shared with us, of helplessness and indignity wouldn’t have happened. That’s why we called this work ‘Not Just a Piece of Cloth’ (NJPC) because cloth emerged as a practical, affordable, easy-to-use and environment friendly product. More so, it helps us open up conversations about the challenges women face around their menses.